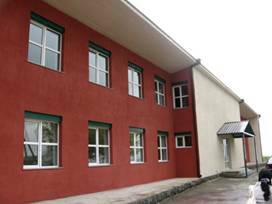 The Ditak village community has a secondary school built in 1967 that provides education to nearly 90 pupils aged from 6 to 17 years. During the last three years, the number of children enrolled in the school has shown a stable increase. Each of 10 grades includes 8 to 14 pupils. Of the 17 teachers working in the school, the majority are women (14). During a visit to the village school in 2009, AWHHE staff were shocked to see the school management and staff working hard to provide the best possible education to children in very difficult conditions with the lack of normal heating, poor sanitation, broken windows and floors, as well as unhealthy state of building materials. 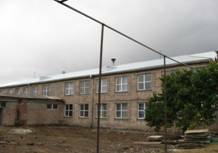 In this state the school had to function in the conditions of dry continental climate with very hot summer (+40 C0) and cold winter (-15 C0) and a heating season lasting from November to March. Although the school had two blocks, the learning process took place only in the main two-storied block where all the classrooms and administration operated. 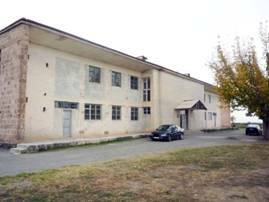 The backblock which was originally meant for a gymnasium and a kindergarten did not function due to disastrous state as a result of constant flooding during the irrigation period. Since the land parcel where the school building is located is mainly surrounded by agricultural land fields, during the irrigation period the level of the ground water flashed up to 1 meter and higher flooding the premises located below ground level (mainly the gym). The primitive draining trench at one edge of the school yard that existed then could not protect the building. Having discussed the situation with the village and school management, AWHHE made a commitment to assist them in improving the learning environment in the school. The architectural company Quelque-chose LLC was asked to develop a reconstruction plan for the school. With all this information ready, AWHHE launched an appeal to donors. Bearing masonry was affected due to not proper roofing and insulation from surface and atmosphere water. 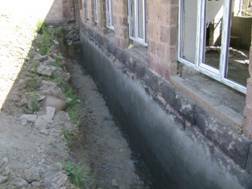 Effective drainage of surface water from the school’s land parcel is provided. The building of the educational block is protected with a new roof. 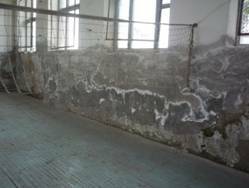 The gymnasium walls were deeply drained by humidity. The mortar and plaster were nearly washed out and surfaces completely got moldy. Reinforcement and insulation of gym’s foundations. Repairing of the lower part of gym’s exterior walls, by putting it in concrete case. In 1994, during extreme energy crisis the large window surfaces throughout the building were reduced by filling their half with poor masonry which resulted in preventing the natural illumination. Correction of all window openings, and heat insulation of surrounding constructions. Replacement of all windows with new ones. 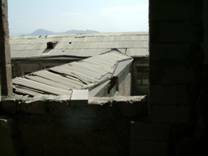 Pitched roofs, covered with asbestos slate, which in its turn poses the risks to children health, were mostly leaking and being repaired by own means of school teachers. The constant influence of water was destroying the walls structure. Changing of the roof covering to profiled metal sheets and avoiding further use of dangerous asbestos slate. Simultaneously reinforcement of roof’s wooden structure and lathing. Unfortunately only the roof of the building of educational block is changed. Reconstruction of the rest is still pending. Interior of all rooms is strongly damaged. Plaster is chapped and moldy. Wall and ceiling finishes are soiled, damaged and washed out. Wooden floors in classrooms and in gymnasium are in a very poor state or completely destroyed. Pupils have their feet on the cold cement lining. The floor slab of the ground floor in some parts is sunk. Old wooden doors are tilted, broken and provide no sound insulation. Wooden windows throughout the building were old, tilted and not isolated. 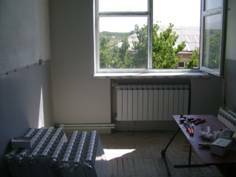 In winter it dramatically increased the heating cost, which is very expensive in Armenia. Main entry door, as well as other 4 exterior doors are also not insulated or sealed at all. Because of budget lack first stage of refurbishment included only partial renovation of interior surfaces (namely interior side of exterior walls). Window and exterior door openings are brought to ordered dimensions and are changed to insulated ones. There are toilets neither for pupils, nor for teachers inside the building. They have to walk about 60 m through the yard even in winter time for their physiological needs (See the situation plan on annex 1). 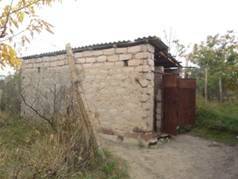 Existing pit latrines are full of smell, not clean and even do not have water for hand washing. Build urine dry diverting toilet (the lack of drinking water makes conventional toilets unreasonable.) adjacent to the school building. Old central heating system has not functioned since 1992. It is now completely not usable. Steel piping is rusty, cast-iron radiators are broken and full of rust. 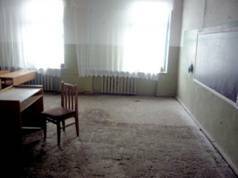 Only classrooms are heated individually by electric heaters, which can provide maximal temperature of +16-17 C0 in winter. As mentioned above the electric energy in Armenia is expensive, and school budget is not sufficient for covering of all heating season expenses. The low temperatures and humidity inside constructions destroy them progressively. A new effective heating system is built using natural gas financed by regional administration. Provide the effective drainage of surface (irrigation) water from the School’s land parcel. Strengthen the wooden construction and exchange the roof covering of the Rest of the building to profiled metal sheets and eliminate further use of dangerous Asbestos slate. 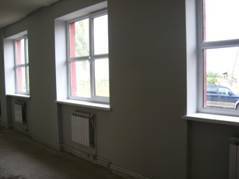 Completely renew the lining and floor coverings of all premises and in the connecting corridor. Exchange all interior doors to solid doors with built-in locks. Build urine dry diverting toilet (the lack of drinking water makes conventional toilets unreasonable.) adjacent to the connecting corridor with the entrance from that corridor. Provide water for hands washing.